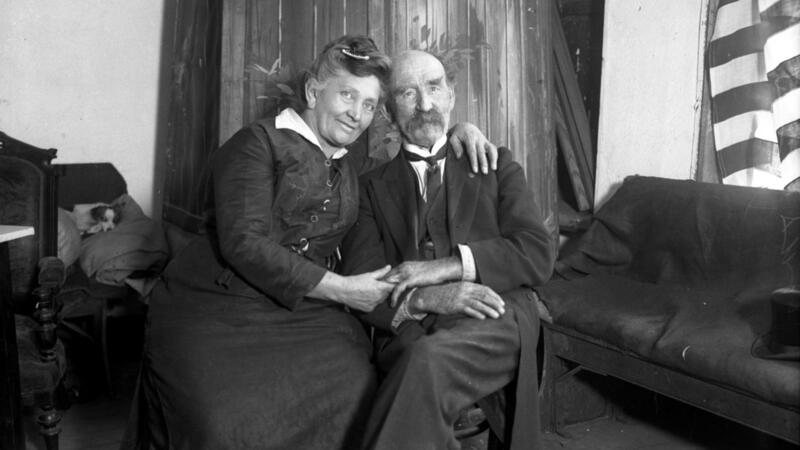 December 8, 1938 – The Chicago Daily Tribune reports that four hotels on the near north side have come together to call the area south of Oak Street and east of Michigan Avenue “Streeterville,” memorializing the name of George “Cap” Streeter, who, between 1886 and 1921, laid claim to close to 200 acres of Lake Michigan shoreline north of the river, proclaiming it the “Deestrict of Lake Michigan.” The manager of the De Witt Hotel at 244 East Pearson Street, R. B. Phillips, is the originator of the idea, and The Drake, the Lake Shore Drive, and the Seneca Hotels agree to cooperate. Each guest at the hotels will receive “blue and green stickers showing a map of the designated area.” [Chicago Daily Tribune, December 8, 1938] The photo above shows the Captain and "Ma" Streeter some two decades earlier. 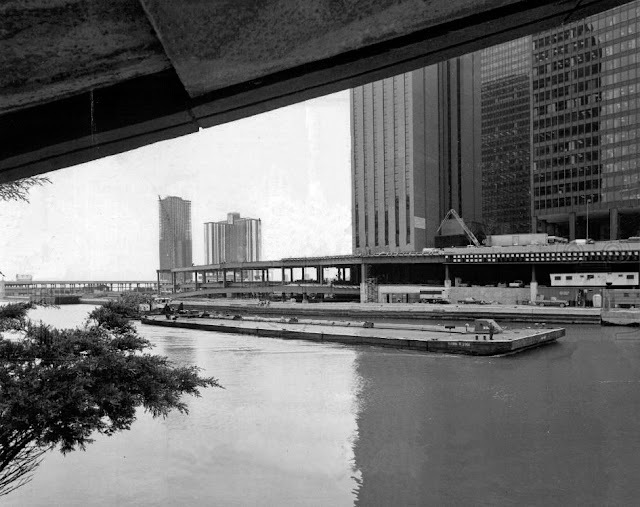 December 8, 1975 – Mayor Richard J. Daley cuts the ribbon and officially opens the $15 million extension of Wacker Drive between Michigan Avenue and Lake Shore Drive. “This project will help people move in the central city with greater rapidity,” the mayor says before he cuts the ribbon. The 1,800-foot elevated roadway crosses land that was formerly occupied by an 83-acre Illinois Central Gulf Railroad yard. It is the hope of city officials that the connection between Wacker Drive and Lake Shore Drive will facilitate the development of the Illinois Center project, which is underway. It is just one part of a huge project that will see the straightening of the “S-Curve” of Lake Shore Drive as it approaches the river from the south and the construction of a bridge that will allow the extension of Columbus Drive across the river to the north. The Wacker Drive extension was constructed with $6.4 million from the Illinois Central Gulf and $8.6 million in federal and state funds. The photo above shows the first part of the extension, finished just past the first section of the new Hyatt Hotel, in 1975. Note the Harbor Point tower under construction in the distance. December 8, 1961 – The third largest insurance company in the nation, the Equitable Life Assurance Society of the United States, announces plans for the construction of a 35-story office building on a lot located between the Chicago River and Tribune Tower. James F. Oates, Jr., the president of the company, says that the building will be “one of the most striking and beautiful in America.” Oates continues, “These are trying days, and many citizens, including business men, are concerned over the future of America and the world. We are not without concern, but we believe with our full heart that the way to conduct our life in these times is to show our faith in America. That is why we are going ahead with this building – to show our faith.” Equitable will occupy about 20 percent of the building’s 600,000 square feet, and the tower will be set back 175 feet east of Michigan Avenue. Mayor Richard J. Daley says that the deal between the Tribune Company and Equitable “demonstrates anew the faith of men of the economic field in the future of this great city of Chicago.” [Chicago Tribune, December 8, 1961] The architectural firm of Skidmore, Owings and Merrill will design the International Style tower with Alfred Shaw acting as a consultant on the project. 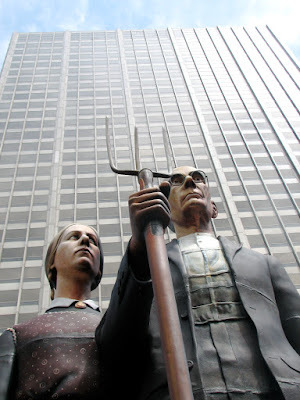 The building stands behind J. Seward Johnson's "God Bless America" in the 2009 photo that I took of what is today 401 North Michigan Avenue. There is a lot less plaza today as the Apple Store now carries the plaza down to the level of the river. Umm, Richard J. Daley couldn't have cut the ribbon for Wacker Drive in 1979.